Our ‘eye’ is firmly fixed on the new trout fishing season starting October 1st. … and we’re back into ‘it’, with our new fishing season commencing October 1st. It has to be said … “things are looking good” for the new fishing season. We’ve had a mild winter in our area with good steady rainfalls to keep the river flows topped up. Thankfully there have been no major floods and our brownies are now drifting back out of the spawning streams and packing on condition ready for this season’s influx of anglers. Bruce (my labrador) and I have walked a couple of local rivers recently and are encouraged by both the size and numbers of the trout we’ve seen. It’s true that in the last two seasons on some rivers in our district, there hasn’t been the numbers of fish that historically we are used to fishing for, due largely to a series of significant floods in recent years. However as fish populations ultimately rebuild, there remains no doubt that the quality and the average size of the brown trout in our rivers still remains among the best in the world. From an outsider’s perspective the upcoming US elections are proving to be ‘intriguing’ to say the least. In my previous newsletter, I suggested bookings from the US might be a ‘bit slow’ prior to the elections, and so they are … this is my 9th US election since commencing guiding in 1980 and the trend has always been the same. What it means however is that right now there are still a few excellent opportunities to fish with me in October and early November. Think of the advantages … there won’t be many other anglers about, the trout will be hungry coming into the new season and they won’t have been fished over much … so someone needs to steal a march on ‘all those serious voters’ and enjoy some early season action! However, the downside for anyone looking for guiding days after the elections, is that a lot of space has already been snapped up and there are now only a few days available with me in December, January or February … which leaves just March for any significant guiding opportunities. March is one of our best dry fly months, generally characterised by lower water levels, lovely warm days (but with temperatures starting to cool again) and some great angling opportunities on big browns in peak condition. It’s a lovely time to fish and enjoy the NZ ‘pace of life’ … so if you are tempted to come later in the season, don’t leave your run too late … give me a call asap and book your spot. ” I would like to take the opportunity to give you all an early ‘heads up’ on the introduction of two new back country fishery designations within the NM Region, plus also alert you all to two that are also coming into force this season within the West Coast … The two fisheries that have been formally designated and subsequently approved as back country fisheries within the Nelson/Marlborough Region are: THE GOULTER Rv upstream from its confluence with the Wairau, and the TRAVERS Rv upstream from the Coldwater / Lakehead Hut track crossing marker. Additional back country fisheries may be added in future but it was considered prudent to start with a low number initially until we have a feel for the additional resourcing requirements needed for compliance and the like. Please be aware that to obtain a free endorsement to enable a licence holder to fish within these waterways, they need to be the holder of an Adult Whole Season, Family, Loyal Senior, or Local Area licence (or a Non-Residents Licence). Holders of day licence, short break or long break licences will not be eligible to obtain an endorsement, so I would appreciate it if you could reflect this advice to your clients where possible. Failure to obtain an endorsement legally falls into the same offence category as fishing without a licence, so our ranging team will be required to issue offence notices where this is encountered (something we would prefer to not have to do). “the internationally significant Karamea and Mokihinui River fisheries (will be designated ) as ‘back country fisheries’ for research purposes. (and Fish and Game wishes to) … encourage a ‘best-practice’ guideline for catch and release of no more than six fish landed per person per day to limit damage to popular fisheries from fish handling and stress. So … this is another major step forward in the management of fisheries in this region of New Zealand. 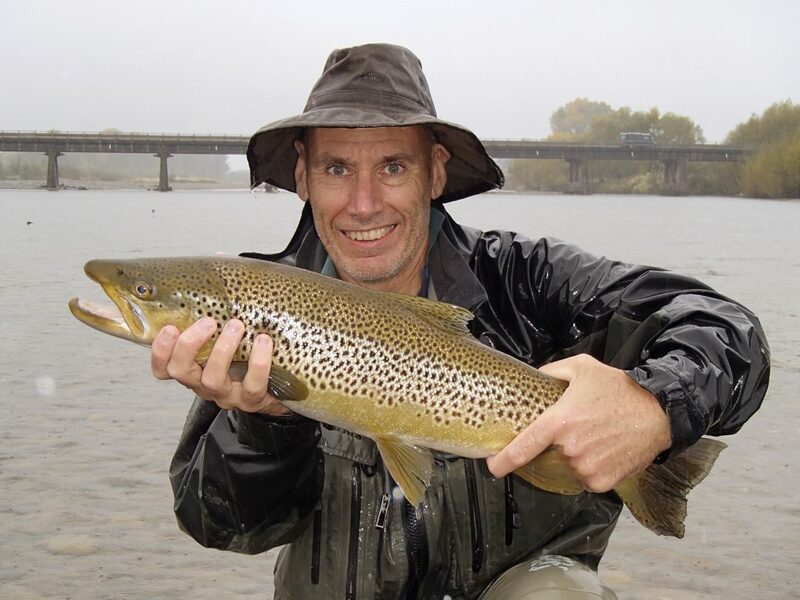 What it means however is that those of you who are non-resident NZ anglers and plan on fishing in the Goulter, Travers, Karamea and Mokihinui catchments this coming season, will need to first purchase a full Non-Resident Fishing Licence (NRL). This allows you to get the free Back Country Licence endorsement, which you can apply for online as per the above instructions, or I can help you apply for it when you get to New Zealand, as and when we do decide to fish any of the above rivers. As more details become available from Fish & Game, I’ll keep you all posted on developments See also (click here). I have just returned from my annual Turangi fishing adventure, chasing winter-run rainbow trout as they run up the Tongariro River and other Taupo tributaries on their annual spawning run. These trout are descendants of Russian River steelhead originally from Sonoma Ck in California. The timing of the peak runs isn’t an exact science and this year it seems we were a bit early. The size of the fish was also smaller than last season, but those we caught were all in excellent condition. Once again I was with a group of friends from my local Nelson Trout Fishing Club and while the fishing was slower than last season we still landed ‘a heap’ of fish between us for our week, most from the Tongariro but also some from the smaller Tauranga-Taupo Rv nearby. One of the highlights of the trip was also attending the first Sporting Life Winter Fly Fest in Turangi as a member of the NZ Sage-Rio-Redington Pro Team. Tore Nilsen (FlyTackle NZ) and Rene Vaz (Manic Tackle Project) joined forces with the boys at Sporting Life to showcase a first in NZ angling, with demonstrations and an opportunity to test their latest fly rods and lines from Sage,Scott, Rio and Airflo. And, I fell in love … with the new Sage X series of rods that is. These new offerings from Sage featuring their KonneticHD technology, were a dream to cast and are set to make a huge impact on our New Zealand fisheries, where accurate presentation and the ability to play large fish on fine tippets are crucial elements in a rod. I tested the 890-4 X during the week on the Tongariro, ‘chucking’ the big bomb rigs that are so effective on that river … and the X made life easy. I have always enjoyed casting my Sage One 890-4, but the X is seriously a better rod, both in casting and playing fish. However my dream rod was the 590-4 X … which could well prove to be the ultimate rod for our local fisheries around here. In describing it, “easy-to-cast, lively, precise, finesse, accurate, smooth, delightful” … all come to mind. So now … just add fish … I weakened and ordered both the #5 and the #8 … (and was also sorely tempted by the #6, but in the interim have at least shown some restraint)! Prior to Sharon and I heading off on ‘sabbatical’ last season I closed down our credit card facilities to save on fees (and ensure more cash was available for ‘essential fishing needs’), which has meant I haven’t been in a position to accept credit card payments for deposits again until now. Over the next couple of weeks I will be sending out deposit invoices for all current bookings for the new season, which will provide my anglers with a number of ways in which they can pay the deposit. I will personally email anglers first to confirm that an invoice and email request for payment will be sent using a new mobile GetPaid app via my Westpac Bank account, which will allow anglers to pay either – via a secure hosted payments page, by direct credit into our bank account or by calling me to process the payment using their credit card. The GetPaid app has been tested to ensure it meets Westpac’s security standards, transactions are processed in accordance with all required industry security standards and no credit card information is stored on my device. In recent years with the substantial growth in the Adventure Tourism Industry in New Zealand, safety has become an increasing concern. Recently new legislation was introduced in the Health and Safety at Work Act (2015), which sets out new work-safe requirements for most businesses in New Zealand. While the guided sports fishing industry was not specifically included in the final Adventure Tourism review (think bungy jumping, jet-boating, ballooning, parachute jumping, mountain biking etc), our New Zealand Professional Fishing Guides Association (NZPFGA) is taking the lead in ensuring members upgrade their current safety practices to comply with the Association’s Department of Conservation group concession. It is not really new ground, because back in Strike Adventure days with Zane Mirfin, we were among the first guides in the country to have an audited Safety Plan, which I subsequently continued to use. Safer and more enjoyable New Zealand angling adventure.